What Are Dental Implants In Jacksonville Made Of? Did you know that 178 million people in the United States are missing at least one tooth? With a number like this, you might be wondering what you can do if one of your pearly whites is removed from your smile. If and when this happens to you – and even if it already has – you can restore your smile to its former glory with dental implants in Jacksonville. In this post, Dr. Larry Young explains what these artificial teeth are made of and how you can maintain them. Implant Post – This is the actual implant itself – it will be surgically placed in your jaw and will become the secure foundation for the other two pieces. Abutment – This is the piece that connects the implant post to the part of your artificial tooth that looks like your original dentition. Dental Crown – This is a tooth-shaped cap that resides above the gum line that looks and functions just like your natural teeth. 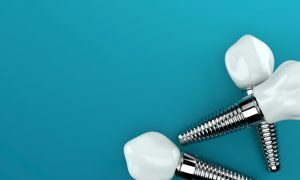 The implant itself is made of biocompatible titanium that fuses with your jawbone in a process called osseointegration. During this process, the post essentially becomes locked in place, which is exactly the result you want – a foundation that’s stable and stationary, not one that wiggles or shifts like dentures do. What Are Implant Abutments Made Of? The abutment can be made of many different materials, including titanium, surgical stainless steel and gold. Recently, newer advancements have been made and abutments are now made from zirconia, which is a white ceramic. Since the abutments are covered by the dental crown, using a white material underneath for this portion gives a better looking result. Dental crowns can also be made of numerous materials, including stainless steel, metal (like gold or silver alloys), porcelain that’s fused to metal, all resin, or entirely ceramic. Since the goal of dental implants is to provide a life-like solution that stays in place, we’ll generally use all porcelain on front teeth, and porcelain-fused-to-metal for teeth in the back of the mouth that undergo the most pressure when chewing foods. How Can I Maintain My Dental Implants? Brush gently twice a day for two minutes, using a soft bristled toothbrush and a low-abrasive toothpaste. Floss using a satin-style dental tape – once a day is sufficient, but twice a day is better. Use interdental brushes, rubber tips, soft picks, or water-irrigation units on your teeth and gums once or twice daily, but only if Dr. Young recommends this to you specifically. Now that you know what dental implants are made of and how you can care for them, schedule your appointment to bring back the winning smile you deserve! Comments Off on What Are Dental Implants In Jacksonville Made Of?